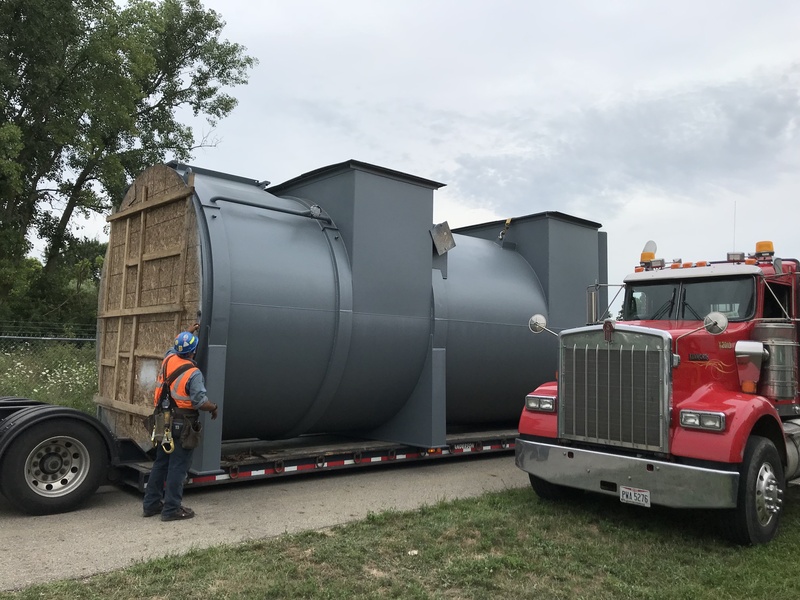 The customer purchased the CPI Recuperative Thermal Oxidizer from a shuttered coil coating facility and stored the equipment outdoors for several years. The equipment was eventually installed and operated for several years without any modifications. In anticipation of an upcoming compliance test, the customer contacted CPI to evaluate upgrades necessary to ensure the performance of the oxidizer. 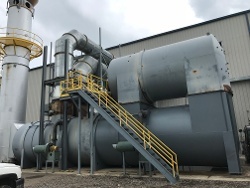 After a thorough inspection of the recuperative thermal oxidizer, CPI determined that the system required repair and replacement components in order to achieve the desired 99% destruction efficiency (DRE). Most notably, thermal fatigue seen on the tubes and tube sheets of the primary heat exchanger were impacting the destruction rate efficiency of the oxidizer. To extend the life of the thermal recuperative oxidizer and achieve the desired DRE, CPI supplied a new replacement combustion chamber and primary heat exchanger. CPI worked closely with the customer to minimize the downtime associated with the disassembly and removal of the old components and installation of the new combustion chamber and primary shell and tube heat exchanger. CPI was able to complete a good portion of the installation activities before the new equipment arrived on site. This approach guaranteed that the entire system was installed correctly, and the facility was back up and producing product with minimal downtime. The rebuilt Recuperative Thermal Oxidizer controls VOC emissions from the application and curing of solvent based coatings on the rolled aluminum process line. Thermal treatment of VOCs and other air pollutants works by a simple reaction of the harmful air pollutants with oxygen and heat. In this environment, the VOCs are converted into harmless inert byproducts, water vapor (H2O), and usable heat. These harmless by-products are typically released to the atmosphere, or in some cases use an energy recovery technique to further lower the operational costs. A Recuperative Thermal Oxidizer utilizes a superior combustion and dwell chamber coupled with a cylindrical design for efficient destruction of VOC’s. The unique design starts by drawing the solvent laden fumes into the high temperature primary heat exchanger where they are preheated. From there the process flow enters the high velocity combustion chamber where it then travels down the elongated combustion chamber at very high velocities, causing flame impingement and turbulence to occur and providing excellent mixing of the air stream. Next, the heated process stream enters the dwell chamber where the VOC and CO are converted to harmless CO2 and H20. The Recuperative thermal Oxidizer’s floating tube primary heat exchanger incorporates free-floating tubes to eliminate thermal expansion. During the oxidizer's operation, each individual tube within the primary heat exchanger will expand and contract at different rates. By allowing the tubes to freely expand and contract, the equipment's life is greatly increased. Established in 1969, CPI is a leading supplier of air pollution control solutions. CPI is at the forefront in providing industries including coil coating manufacturers with solutions to their air pollution control needs.